This page is about the construction of a specific type of simple horse clothing. 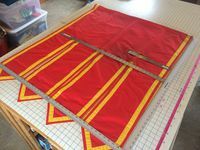 This is not a completely comprehensive step-by-step set of instructions, just a set of pictures, notes and tips sufficient for a reasonably experienced seamstress or tailor to construct a similar one. This green saddlecloth was made for a 35" tall miniature horse ridden by a 5 year old. The proportions are significantly different than for a full size horse, but is shown here to give an idea of what these look like in full. The remaining pictures (of the red/yellow and the blue/red sets) are shown folded in half. The red set was made to compliment a 16h draft cross with an average length back, covering a dressage saddle pad, under a dressage saddle. 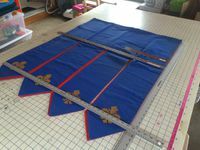 The overall width of the red set is approximately 39". The length from the fold to the ends of the dags is 48". The opening for the girth is 18" down from the fold, 8" back from the front edge of the cloth, and about 6" long. The dags begin at 23" down from the fold and are around 9" wide. This set is made from red trigger cloth lined with yellow cotton/ploy broadcloth and decorated with stripes of the same yellow broadcloth. The blue set was made for a 16.2 Thoroughbred with an average length back, covering a western saddle pad, under a western saddle. 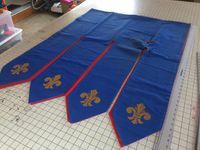 The width of the blue set is approximately 34". The length from the fold to the end of the dags is 44". The opening for the girth is 15" down from the fold, 8" back from the front edge and 6" long before originally. It's since torn with use to be somewhat wider and closer to the front edge. The dags begin at 18" from the fold and are 8" wide. This set is made from blue trigger cloth lined with red trigger cloth and painted with acrylic craft paint treated with "textile medium". 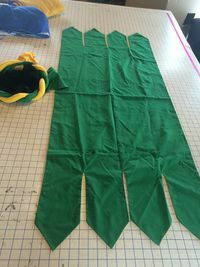 For both sets the construction method was the same - lay out the fabric and the lining together, mark the stitching lines for the dags and pin everything together firmly. Sew along the stitching lines for the dags and along the front and back seams of the main body of the saddlecloth, leaving an opening for turning. 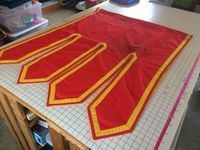 Once the stitching was completed, the dags were cut 1/4" out from the seam then the entire thing turned inside out and ironed, then the opening for turning stitched shut. The girth openings are simply very large buttonholes. A simple variation on this design would be to change the shape of the dags. For ease of construction, the dags should be stitched before they are cut out. This page was last edited on 29 March 2015, at 11:33.